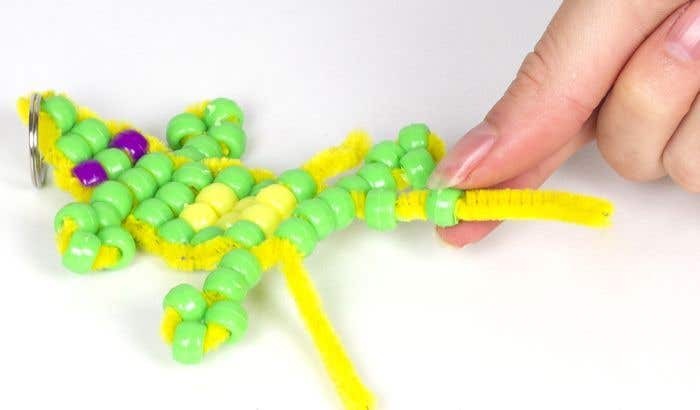 Make your own gecko keying using just beads and pipe cleaners! 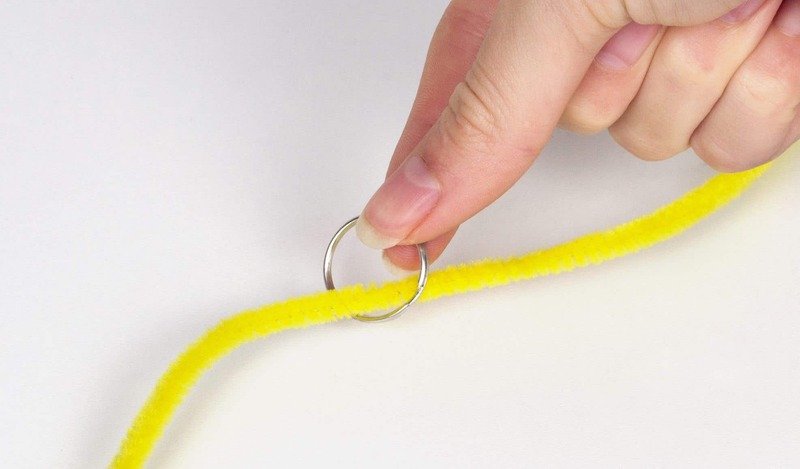 Take a yellow pipe cleaner and thread it through a split metal ring until the ring is halfway down the pipe cleaner. Take a green bead and thread it onto one end of the pipe cleaner. Then thread the other end of the pipe cleaner through the same bead in the opposite direction. Repeat step 2 but with two green beads. Then again with three beads (purple, green, purple). The purple beads will create the eyes. Add two more green beads using the same technique. Then add five beads to each end of the pipe cleaner and fold it back on itself to create the legs. Thread a new yellow pipe cleaner through the two beads at the bottom, then repeat the same technique you used in step 2 to create the body following this pattern – 3 (all green), 4 (green, yellow, yellow, green), 4 (green, yellow, yellow, green), 4 (green, yellow, yellow, green), 3 (all green). Add five beads to each end of the pipe cleaner and fold it back on itself to create the bottom legs. 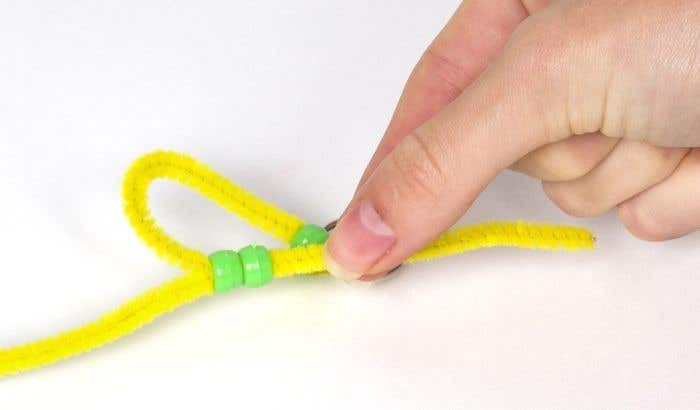 Add a new pipe cleaner by threading it through the bottom three beads, then add two more green beads using the same technique as step 2. Use the same technique to add one bead underneath. Then repeat this four more times. Fold the ends of the pipe cleaners to the back of the keyring, then trim the ends. 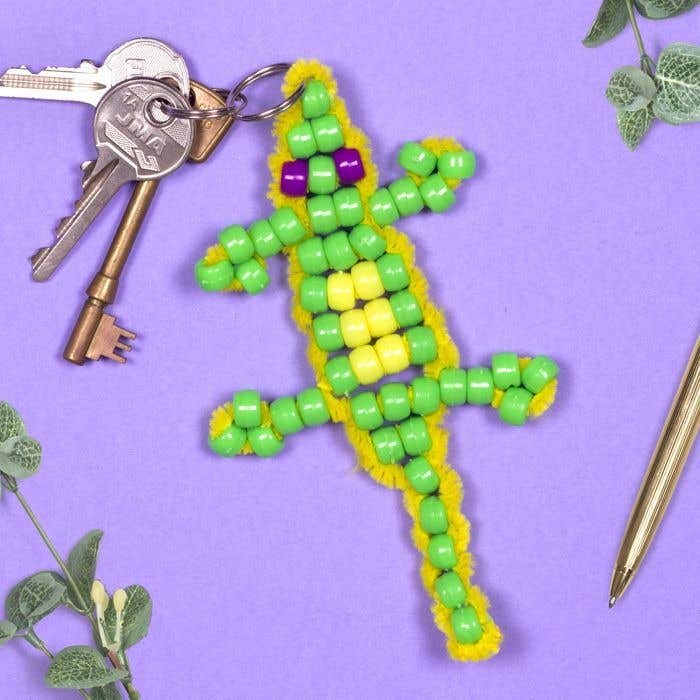 Try creating multiple gecko keyrings for family and friends using different coloured beads.